The Arbortext Publishing Suite is an end-to-end authoring and publishing solution that can meet and exceed the publishing needs for any single sourced content needs. The best part is the ability to create complicated style without having to be a programmer. 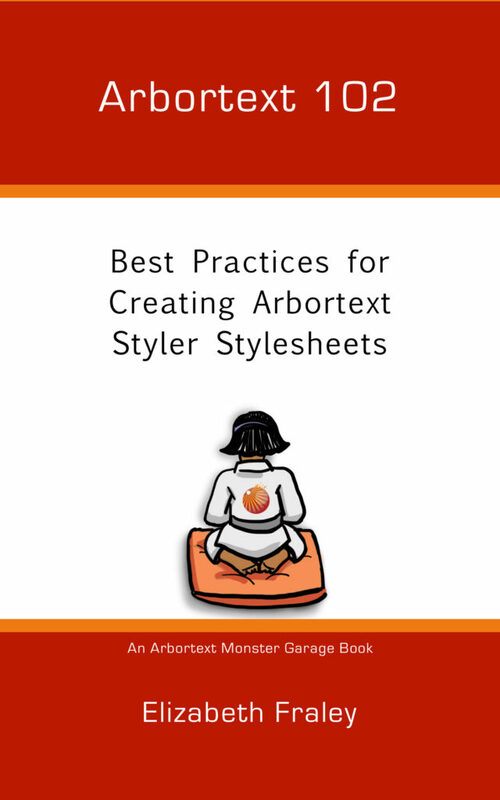 Elizabeth Fraley, adding to her Arbortext Monster Garage book series wrote “Arbortext 102” to help stylesheet designers learn best practices for creating Arbortext Styler stylesheets and customers evaluate the quality of stylesheets delivered by consultants. Her easy-to-follow approach offers practical tips and pointers enabling readers to quickly get started developing dynamic and multi-channel stylesheets using Arbortext Styler. Get started quickly — Create a stylesheet in a day! Help us celebrate the release of 102 and get Arbortext 101 for only 99-cents today at Amazon!